Until the Liberals came to power, it was not customary for the mainstream media to shower governments with praise. I intend to practice my profession the traditional way – the way I was treated when when I was in government. Allow me a short anecdote, Premier. In 1975, during the Dave Barrett NDP years, I was the nominated candidate for the Social Credit Party for Kamloops. Each evening I would faithfully read the late Sun Columnist, Marjorie Nichols, chortling with glee as she regularly kicked hell out Barrett. Night after night I listened, enjoying every syllable. On December 11, I won a seat in the general election and on the 22nd, was sworn into cabinet. It wasn’t long before Marjorie, good old Marjorie, was kicking hell out of Bill Bennett! Then me! What the devil had caused her to change? Well, she hadn’t – it was the government that changed! Mr. Premier, I have two points today. The first is on LNG – you seem to have a blind spot about Woodfibre LNG proposed for Squamish. Do you not know Howe Sound, Premier? Allow me to introduce you to some of my neighbours in Howe Sound, my backyard. Next to the beautiful Chinook Salmon, or Spring as we used to call them, those are Orca, commonly called Killer Whales, which abounded in Howe Sound when I was a young boy in the 30s, along with humpback whales, seals, porpoise, dolphin, all 7 species of Pacific salmon native to BC – and herring. They all gradually disappeared from much of Howe Sound, largely due to industrial development. Some 20 years ago, the government, with massive involvement of ordinary people, went to work and began cleaning up the old pulp mill site in Squamish and the mine site at Britannia. Slowly but steadily nature healed and our friends were all back. Surely you have a soul, Mr Premier, and can understand what this means. Well, the biologists tell us that with an LNG facility in Squamish, with their discharges and tankers, we’ll almost certainly lose it all again. Do you know, Premier, that the environmental process held for Woodfibre LNG was as phoney as Confederate money, having been conducted, so to speak, by the National Energy Board in hearings so roundly criticized by Prime Minister Trudeau, who now relies upon them? Did you know, Mr. Premier, that Howe Sound is too narrow for LNG Tanker traffic by world standards, US EPA standards and – get this, Mr. Horgan – by the standards of SIGTTO, the Society of International Gas Tanker and Terminal Operators (the Industry’s own organization) and that the Federal Liberal government hasn’t taken this into account? You are our premier, Mr. Horgan, and Howe Sound, the most southern fjord in Canada, an internationally renowned beauty spot, is on the brink of ruin by the LNG industry, and you are on record as supporting Woodfibre LNG! Why, Premier, in the name of God, why? Now I turn to the Kinder Morgan pipeline, over which both you and your Attorney-General David Eby were dressed down by Justin Trudeau and you hung your heads like naughty schoolboys. I can’t speak for others, Mr. Premier, but I watched conference after conference attended by Premier Bill Bennett with Justin’s father – twice the man – time and time again standing up to him and for British Columbia. I have little doubt that Dave Barrett would have done likewise. You cringe because if, as you first suggested, BC works to rule, thereby delaying provincial permits for Kinder Morgan, BC will be sued. I hate to mention this because he is a fine man, lawyer, accomplished author, teacher, civil rights advocate and activist – all accomplishments I admire and indeed he’s a man I admire – but David Eby is not a British Columbian of sufficient length to have all the assets, especially the animal life of Howe Sound and the Salish Sea, engrained in his psyche as is necessary for a BC warrior to be prepared to go to the wall for this province. A man who has the commitment I’m talking about is Grand Chief Stewart Philip, President of the Union of BC Indian Chiefs; others include Green Party Leader Elizabeth May, who is personally prepared to go to jail; a man like Mayor Derek Corrigan of Burnaby; Vicki Huntington, former MLA; Kai Nagata, communications director for the Dogwood Initiative; Vancouver City Councillor Adriane Carr; but more than this, Premier, while your Central Canada-loyal Attorney-General is quaking in his boots because someone might sue us, for using the obvious “work-to-rule” tactic of delaying provincial approvals, you’ve also chickened out. 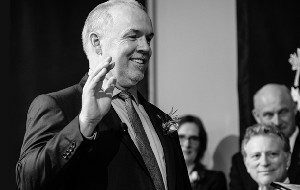 For God’s sake, Mr. Horgan, thousands of British Columbians are prepared to go to jail while you and the Attorney-General, leaders of the party of protest, heirs to the men and women of the people whose names you still mention in hushed terms of reverence, are afraid that if you stand up for our sacred environment, that nasty man Trudeau Minor or big, bad Kinder Morgan might sue us! Do you think that real British Columbians ready to risk going to jail are going to be pushed around by a coward from Ottawa, propped by the oil industry, just as you apparently are? Time is short, Mr. Horgan, and I suggest that you and the Kid from Kitchener, David Eby, look in the mirror at two politicians prepared to sell out their province, so that the Tar Sands can hum away, polluting the earth’s atmosphere and so Justin will be nice to you as he goes back to chasing old Tory seats in Alberta. If Kinder Morgan happens on your watch, do you think voters will forgive you because some lawsuits were threatened? I tell you plain, Premier, it won’t be a mere 16 years next time if Kinder Morgan is forced on British Columbians who marched and went to jail while the quislings in Victoria skulked in their offices and sent obsequious emails to Kinder Morgan and Justin. Not a very good start, Mr. Horgan, not a good start at all.